We rolled up pitched battle & annihilation for the mission. 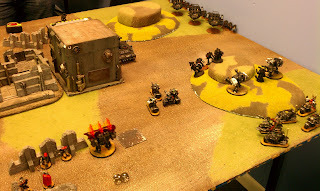 The Iron Hands took first turn and were packing a lot more firepower this time around: 2 shooty dreads, snipers led by Telion, 4 missile launcher devastators, 3 typhoon/HB speeders, 2 full sized tactical squads, and 8 tactical terminators led by Lysander and a Librarian. 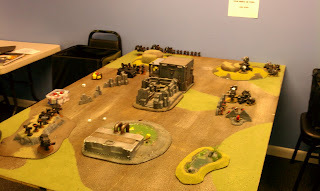 I was rolling with Khan, my 4 plasma command squad, Master of the Forge on bike w/ conversion beamer, 2 full sized bike squads packing meltas, sniper scouts led by Telion, 2 rifleman dreads, 2 plasma cannon dreads, and the debut of my brand new (finally assembled) thunderfire cannon. First turn, all of my dreadnoughts were suppressed or destroyed, half of my scouts were killed and the Iron Hands Telion "telioned" the Raven Guard Telion (yes, despite the 2+ stealth/bolstered cover save). But what was important was that my Thunderfire survived the first volly, as I was really interested in seeing how that would perform. Have to say, I'm really impressed with it! 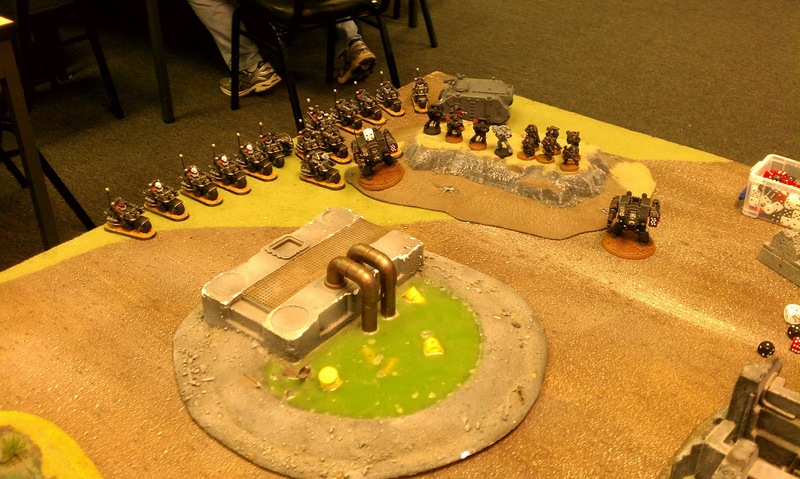 In my turn, it put 15 wounds on the terminators which helped to thin them out. I'm pretty sure it earned its points back with that one volley (which is good because it died the next turn). I'll definitely be using this in future games and really wish the kit wasn't so horrible or I'd run a couple of them. Maybe I'll convert or scratch build a second one if I can find some decent inspiration. Second turn, the terminators gated forward and let me tell you, Lysander alone in your deployment zone is scary enough without the bodyguard. 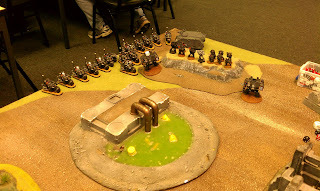 I didn't really have a way to deal with him, not unless my plasma command squad and other full sized bike squad came in on that side of the board and poured everything into them. But when they came on in my turn 2, they insisted on the opposite side of the board. I was left to deal with Lysander and the terminators with my surviving techmarine and a plasma cannon dread. They did alright in tying them up for a turn. 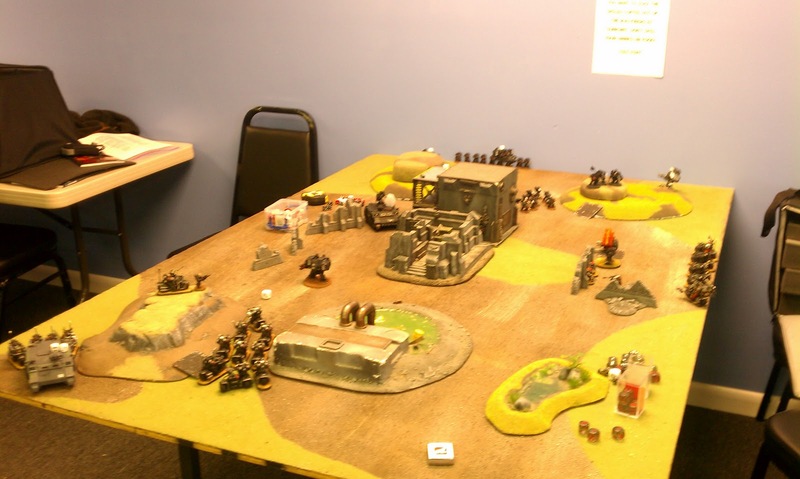 This was also the first game in which I've used a conversion beamer on my MotF. It did alright dealing with a dreadnought and a typhoon, and the bike really helped him get those long range, higher strength shots. That being said, I still think it's a little too pricey for what it does. In general, whenever I want to take a MotF in a list I feel like I should take a lot of dreads just to make full use of his abilities. But I've really grown accustomed to having vindicators in my list, and will most likely return to those (AV13 really does make a difference). We had to cut the game short a bit, but in all honestly I wasn't in a position to catch up to John's army and all the damage they had inflicted. It would have taken awhile to get my remaining bikes to the other side and even then I would need to roll a lot of cover saves. It was a good game and I'm looking forward to making some tweaks to my bike list. I was going back and forth on whether or not to take Khan after my games at Blobs, but what I've learned with him is this: he's an absolute beast in combat and can deal with almost any small squad single handedly. But the thing that makes him worth his enormous price tag is the OPTION of outflanking. I emphasize "option" because when I first started using him, I felt like I needed to do this with every squad that could, but this isn't always a good move. But some situations and facing certain army builds, this is absolutely a game changer. The games I've left him out I've seriously missed this ability and what he brings to the table. Most of the lists I've shared on this blog are way too top heavy, spending far too much on the HQ slot to be really competitive on the tabletop. I need to try cutting out the command squad and any secondary HQ like MotF or a Chaplain and see what that allows me to do with the rest of my list. But Khan has always performed well and has had a positive impact on the biker list in general. I just need to make sure I play to his strengths in the right circumstances and remember that outflank is situational. It's too bad we had to stop just as things were getting good. I feel like an epic showdown was going to happen in the middle of the table. Khan vs. Lysander! and all of our troops because we killed off most of the support units on both sides.